The EMBA program is an excellent investment in your future, however we know that financing EMBA studies can be challenging. Here are some ways that can help you. Early Bird registration. 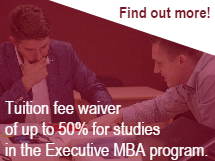 Apply for EMBA studies by September 3 and receive 10 % discount on tuition. Special tuition fee waiver of up to 50 % for individuals from governmental organizations, diplomatic sector and NGOs. Contact your EMBA program adviser about EMBA financing options.